Kim Peek, the savant who was the inspiration for Barry Levinson’s original screenplay and film, Rain Man, died last week at age fifty-eight. The New York Times obit limns the many extraordinary abilities and skills this man possessed. Of those, none is more head-snapping than the astonishing skill that allowed him to simultaneously read facing pages of a book— one with each eye. He ultimately read as many as 12,000 volumes. Even more remarkable, he could remember what he had read. Mr. Peek loved Shakespeare and had memorized so many of the bard’s plays that he became compulsive about accuracy. His father said that they had to stop attending performances because he would stand up and correct the actors. “He’d stand up and say: ‘Wait a minute!’” Fran Peek said. (I recall an opposite and quite amusing situation. Once, when George S. Kaufman was sitting in the audience of his play The Coconuts  starring the Marx Brothers, he was startled. His companion asked him what the matter was. “I think I just heard one of the original lines I wrote.” Mr. Peek would likely have stood up and ripped Groucho a new one). Now, I don’t know about you but the ability to read two opposing pages of text at once - one with each eye - is, as far as I’m concerned, a super-power beyond the capacity of mere mortals. To read 12,000 books and remember them all? 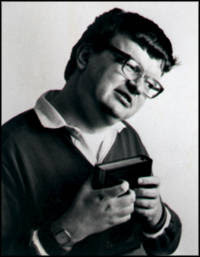 Kim Peek: Biblios, the God of Reading. How did he do it? Reading opposing pages of text, each eye individually tracking each line on each page twists the mind even considering this ability. I'm determined to find out how this neurological gymnastic can possibly be accomplished and will report on what i discover. Keep watching the skies - both eyes watching independently.